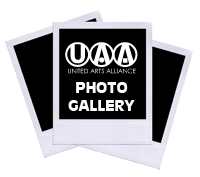 Join us for the 2017 UAA Hall of Fame celebrating community members and their contribution to the arts. April 2, 2017 from 12 pm to 2 pm at the Woman’s Club Building, 108 S. Jackson Street in Janesville. Are you a High School Senior or College Student in Rock County who excels in the arts? Apply for the 2017 UAA Scholarship. Love the arts and want to be involved in the local scene? We are planning the Janesville Area Creativity Awards banquet for 2018 and would appreciate your help and enthusiasm. Interested in Supporting the ARTS in Rock County? We would love your involvement in any way to help improve the arts scene in Rock County. Monetary donations, time, talent, or ideas…we’d love to have you on board. Fill out the membership application and you will be contacted with more information about getting involved. Let’s make the Rock County Arts Community grow and prosper! Click "Join UAA" under the "About" tab.